It is with much excitement that I would like to share to y'all that I'm an Althea Angel!!! Althea Angel today, Victoria's Secret Angel tomorrow! No, just kidding hahaha. I am so excited to be an Althea Angel as it feels so full circle ish to me. I remember being one of the first Philippine bloggers approached for their Philippine launch. From the first transaction, I was already so impressed that my items came to my house incredibly fast and that I didn't need to go to the post office. To add, the pristine pink box stood out among all the tattered, taped, and torn brown boxes most packages from abroad came in at the time. It feels natural to be promoting them further as an Angel, as I myself have been a regular shopper at Althea since its launch. The healthy 'Althea Korea' tag here on blog will serve as the testament to how much I love them! As an avid collector of Althea boxes myself, it felt so surreal to be receiving a special Angels box. This will definitely be kept and treasured! To add, the design is waaaaaay toooo cuuuuute for my layffff. 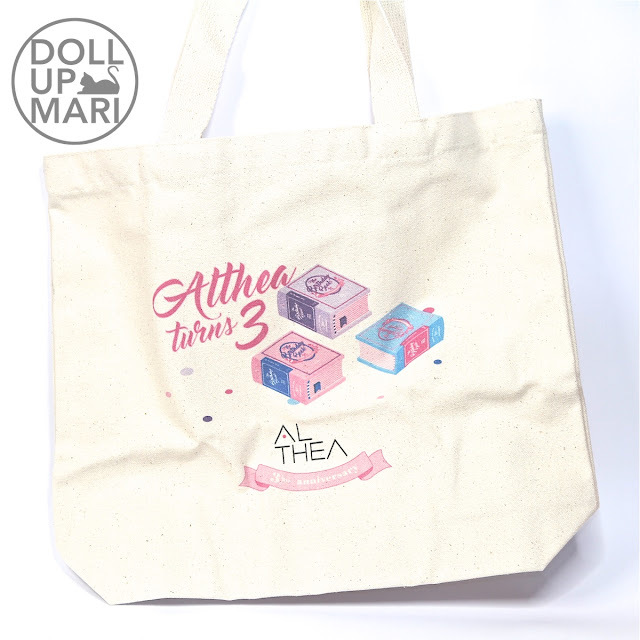 In the spirit of Althea's 3rd anniversary, they were also sooo sweet to have sent over an Althea Turns 3 canvas bag. I'm technically not needed to review the bag as it's a freebie for all customers who met a certain threshold. But lemme just say that this bag is especially thick and sturdy. To all the people who hoarded Althea stuff to get this bag, y'all made the right decision. Advance kayo mag isip. And they sent in the cutest birthday props ever!!! When Althea turned 1, they sent in a birthday hat with emoji decor as well as an Althea balloon. When they turned 2, they sent in a birthday cake shaped box and mini birthday streamers. This time, they reaaally upped the ante and created miniature versions of their birthday edition boxes. Mind you, even the exact text on the interior of the big boxes is also in the interior of these mini boxes!!! These are just as big as matchboxes in real life, so every girl who got these reaaally must've squealed in delight like I did. As an angel, I was given a chubby pouch. And in the most Korean gesture, they sent in an Althea Angels mirror. I dunno how it came to be, but someone must've realized that the mirrors that bloggers used in their videos could be a marketing opportunity. I fondly treasure this mirror as it joins several other mirrors that have memorable stories attached to them. And for the good stuff!!! Althea recently collaborated with Get It Beauty and released their Real Fresh Skin Detoxer! As far as I know, it's safe to say that these are the world's first instant wash off non-clay mask packs! Usually, we think of washing off clay based masks, but we wash it off after 15-20 minutes. And then when it comes to packs, the idea is that the pack should be left on overnight. But this is a first. Because this has no clay, and needn't be left on overnight. It also only needs to be left on for 10 seconds before it's massaged and subsequently washed off. This is perfect for all of us girls who want to be pretty but are unfortunately stuck in this era of overwork. I also think that this is gonna be a good item for those who want to do habit building with skincare as these packs take so little effort and time to use. They have two variants, namely Rose and Green Tea. The Rose variant is designed to be used for daytime refinement. Its job is to clarify the skin from impurities acquired all night long, to prep skin and make it supple and glowing for another grueling day ahead. If you guys are wondering, yes, those specks inside the tubes are real crushed roses––they're crushed May roses all the way from France! They say that May roses are rare, and are even more effective than usual roses. That's why this item is so promising. This was definitely something that caught my attention as I love anything and everything rose. This, for me, has a mild and refreshing rose fragrance, which I think is the right kind of fragrance for a facial product. If they were to make this smell like rose perfume, it might get too overpowering. The Green Tea variant is designed for nighttime use. Its job is to purify skin from all the impurities acquired during the day. And it's there to soothe and refresh tired skin after a long day at work, as well as getting rid of accumulated dust and unwanted sebum. This product, like the rose one, also comes from natural origins, having been made with genuine green tea leaves from Jeju island. They harvested baby green tea leaves for this, that's why there is an exceptionally high vitamin C content as well. AND I JUST HAVE TO SAY IT IN CAPS LOCK THAT THIS SMELLS LIKE ELIZABETH ARDEN GREEN TEA PERFUME OMG IT SMELLS LIKE HEAVEN Y'ALL NEED LIKE 20 OF THESE. For a limited time, you can get both the rose and green tea detoxers at Php1,100! But it's for a limited time only, so hurry! I am definitely looking forward to sharing more about my new finds about Althea in the coming weeks and days. Please send some love in this new journey of mine <3 잘 부탁 드립니다!! Hope you get to try it soon coz it smells soooo good!! !